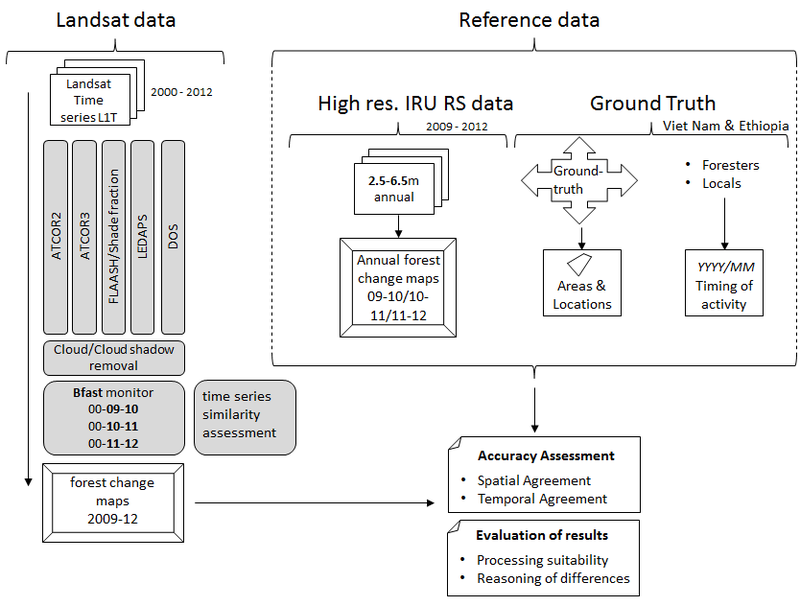 In the future Sentinel 2 time series will be combined with existing Landsat time series. Researchers who use remotely sensed data can spend half of their total effort analysing prior data. If this data pre-processing does not match the application, this time spent on data analysis can increase considerably and can lead to inaccuracies. Despite the existence of a number of methods for pre-processing Landsat time series, each method has shortcomings, particularly for mapping forest changes under varying illumination and data availability conditions. Based on the requirements of mapping forest changes as defined by the United Nations (UN) Reducing Emissions from Forest Degradation and Deforestation (REDD) program, the accurate reporting of the spatio-temporal properties of these changes is necessary. We compared the impact of four fundamentally different radiometric pre-processing techniques Moderate Resolution Atmospheric TRANsmission (MODTRAN), Second Simulation of a Satellite Signal in the Solar Spectrum (6S), Spectral Unmixing, and simple Dark Object Subtraction (DOS) on mapping forest changes using Landsat time series data. Breaks For Additive Season and Trend (BFAST) was used to jointly map the spatial and temporal agreement of forest changes at test sites in Ethiopia and Viet Nam. The suitability of the pre-processing methods for the occurring forest change drivers was assessed using recently captured Ground Truth and high resolution data. Because the Vietnam test site has low data availability and an extremely intense topography, the time-consuming yet physically superior MODTRAN- based pre-processing method is expected to yield the best results. Spectral Unmixing is a suitable alternative, as it accounts for topographic effects as well. For the less topographically intense test site in Ethiopia and its higher data availability, the 6S technique is expected to be the most efficient in terms of processing complexity and accuracy. The combination of 6S (which accounts for atmospheric effects) and Spectral Unmixing (which accounts for topographic effects) is likely to be considered as the most robust and efficient pre-processing method for Landsat time series analysis tropical forest change mapping.